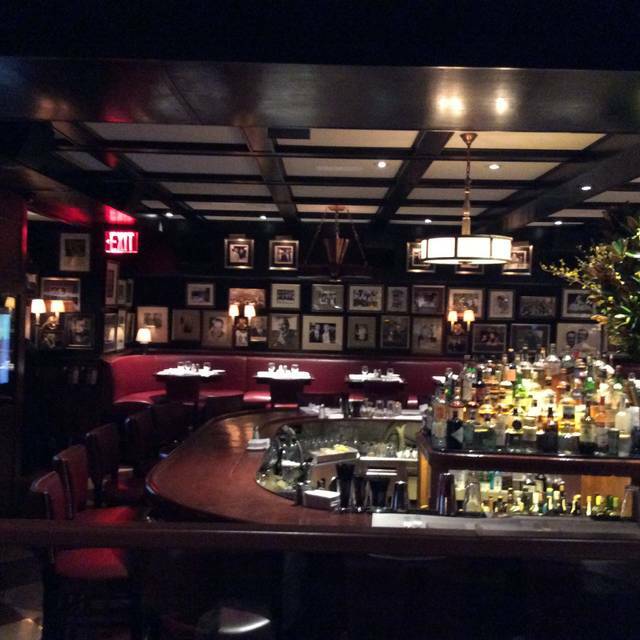 You must make reservations at least 5 minutes in advance of the time at Gallaghers Steakhouse - Manhattan. A, C & E trains to 50th Street and 8th Avenue, 1 train to 50th Street, and N, R & W trains to 49th Street. Gallagher’s legendary Trophy Room is the preferred venue for a myriad of events: Broadway show openings; corporate/pharmaceutical meetings; celebratory events; and the Giants Annual Kick-off Club luncheon started in 1965. It was also Bill Clinton’s last campaign stop before he became President. 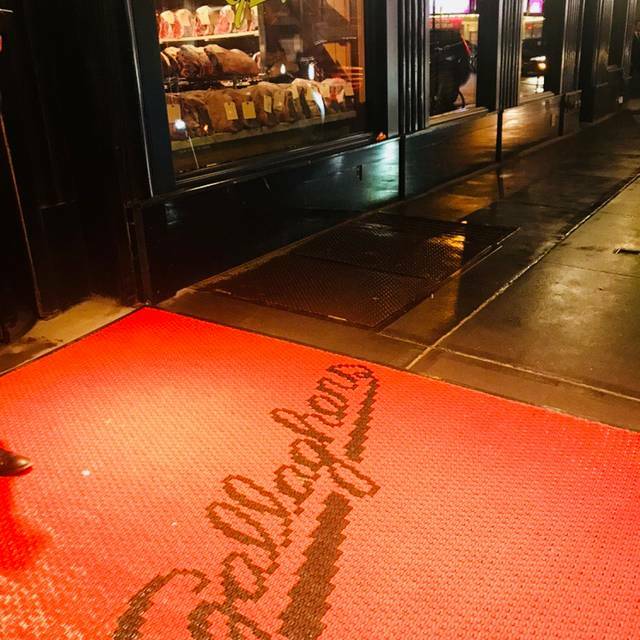 Founded by former Ziegfield girl Helen Gallagher and the colorful gambler and sports enthusiast Jack Solomon, Gallaghers opened as a speakeasy and steakhouse in 1927. 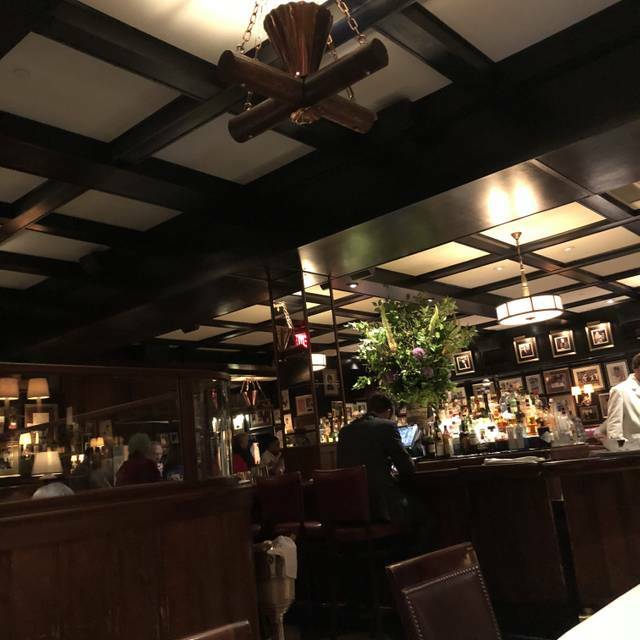 At that time, the height of Prohibition, a good stiff drink and a great steak were hard to find in New York – except, of course, at Gallaghers. 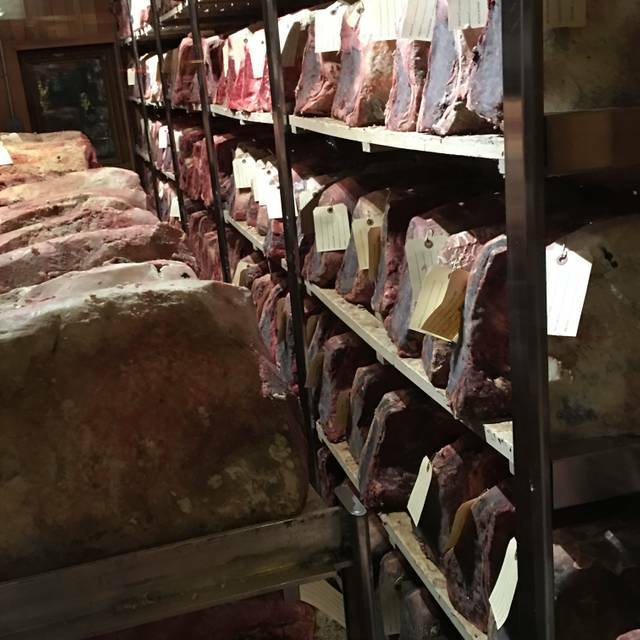 New Yorkers come for the world-class cocktails and incredible steak – prime beef dry-aged for 21 days in Gallaghers’ legendary windowed meat locker. The combination of all-natural dry aging and cooking it to perfection over hickory coals makes for a steak unlike any other found in New York. Celebrated my 28th wedding anniversary and two other birthdays here. The waitstaff was very accommodating, seafood was extremely fresh and steaks were great. I would go back here because of the atmosphere. 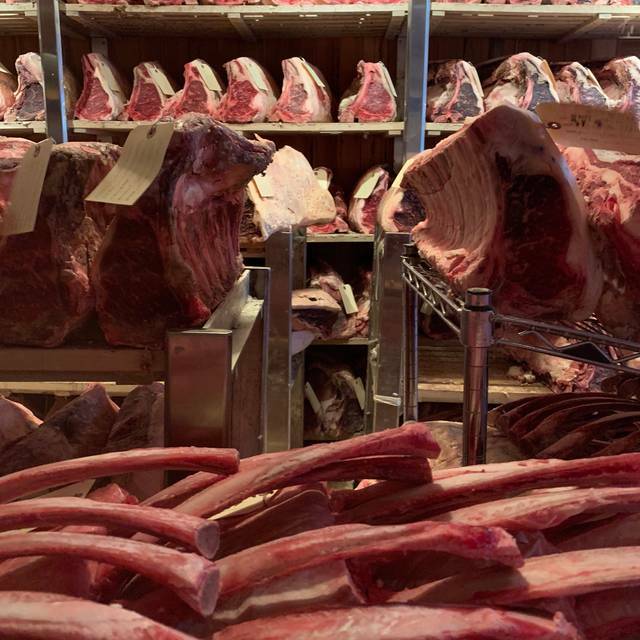 A classic New York steakhouse featuring 21 day dry aged prime beef. Great food, atmosphere and service. Always consistent food! Just didn’t care for the gentleman who is the maitre di. He seemed not happy to be there wasn’t very pleasant. But still great rest overall!! Brought my boyfriend here for date night, it was his first time in NYC and I wanted it to be special. Couldn’t have asked for a better experience. The food was delicious the staff was top notch and it was a great evening. Yummy delicious tender ribeye. Worth the money. My daughter also likes the crab cake appetizer. She thought it was her best experience even though we are from Chesapeake crab cake area. Celebrated a birthday, the food was delicious and the service was wonderful. Best tomahawk steak we’ve ever had. 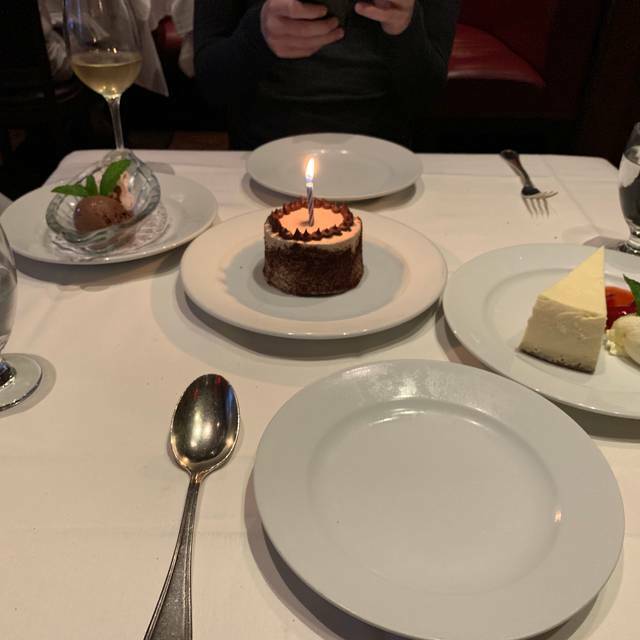 Our pre-theater lunch was to celebrate a birthday and EVERYTHING was just perfect--even the singing with a complimentary dessert! It was a WONDERFUL start to a festive event. Really nice steakhouse with a warm ambiance. Classic setting with old school stuff. Sometimes too ambitious. Excellent steaks and starters. Don’t miss the deserts! Extensive wine list with lots of gems. But it’s gonna burn your credit card. Amazing food and wonderful service! Order the crab cake and macaroni and cheese! You won’t be disappointed. 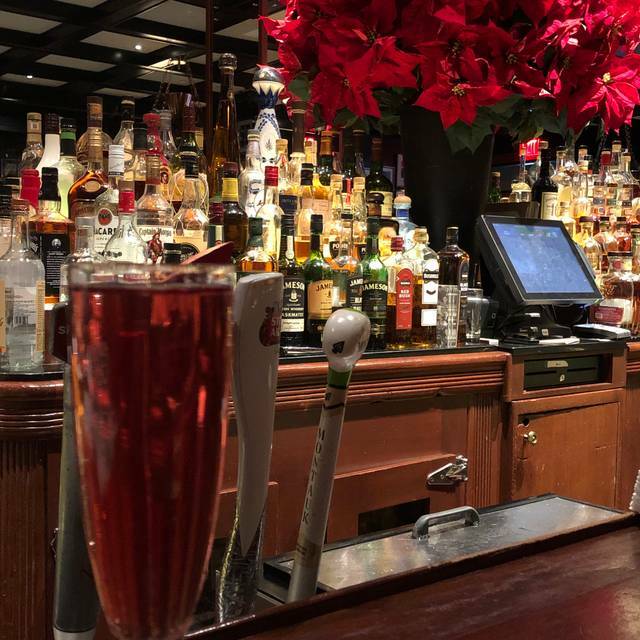 Amazing cocktails at the bar and outstanding service at your table. One of the best steaks I've ever had. NY Strip! Highly recommend. Old School dinner with class! Same goes for wait staff and other employees. Service is spot on. Great food, great servers, excellence at its best. Great food. I really enjoyed the filet, cooked perfectly. Family enjoyed seafood dishes. I would recommend. It’s simply overrated, overcrowded and noisy. I’ve had equally good steaks elsewhere without the pomp. Portions of sides are enormous and expensive, 13 dollars for onion rings or spinach. Every thing about our experience was exceptional except for when we were exiting the restaurant. It was my two children, my husband and myself. We made our reservations late because we had been touring the city all day so we didn’t leave the restaurant until prob 1130. My two kids were 13/14 year old girls. They were dressed up one because they’re teenage girls and two the establishment is a nicer place. As we were leaving two waiters were speaking near the bar area and I head the grey haired older waiter speak very unbecoming things about my two girls. Look at these two F**king 12 year olds out and dressed like that. Now I just spent over $300 at this establishment and this waiter decides to say rude things. I wasn’t expecting something like this to happen at such a wonderful place. As I said before our meal, our service from being checked in to standing up to leave, and our waiters for our table were overly exceptional!!!!!!! Unfortunately that last part of our venture there was very unbecoming. We had a very nice meal with our extended family. Good steaks. Most definitely, the food & service was out of this world. When you go to Gallagher’s, don’t think high end steakhouse. It’s not. Think of a lunch counter diner that serves steak. They will make you feel like they’re in a hurry, literally throwing dishes at you on your table and they’ll crowd you in within elbow distance of the table next to you...and we even had reservations. I will give them props for the New York Sirloin - perfectly grilled, medium rare, tender and flavorful. However, my wife’s medium rare salmon was first served as an overdone piece of swordfish and then after we convinced them it was wrong they replaced it with an overdone piece of salmon. They agreed to comp us for the fish, but the night was lost. Not likely to risk a night on this experience again. Great dinner!!! Whatever you do, order the lobster cocktail appetizer - it was basically a whole small lobster (tail and claws) for only $19 - and it was fantastic tasting!!! Have ate at Gallahers before and are usually pleased. Ordered two prime ribs in advance so they could be cooked an alleged 12 hours. Steaks were tough and difficult to cook. Waiter Adam was stellar though. Really like this place. Try to get here on almost every trip to NYC. Great bartenders and drinks. A perfect Manhattan, as you might expect! My filet with a cajun rub was perfect. My wife's filet was good (just a tad more cooked than she ordered). Great wine list. Found a pretty good value there. The waitstaff was attentive. 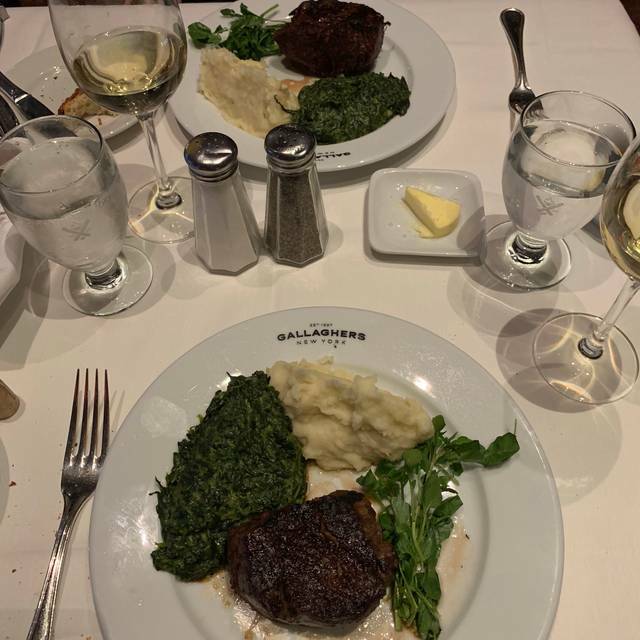 We both ordered the 10oz filet mignon and it was cooked to perfection. Would return in a heartbeat. We were very pleased with the dining experience. What a great Restaurant, we will definitely visit here again the next time we are in NY. The food and service were worth the wait as we were unable to be seated at our allotted time and had to wait 15 mins. While the steaks are high quality and reasonably well prepared, we especially were not impressed with the service. There were countless waiters but still we waited quite long to receive attention and once we did, it seemed they wanted to rush us through the meal with the steak coming immediately after the appetizer was taken away. Our waiter had problems opening a bottle of champagne and filled the glasses to the rim. We ordered a rib eye and a lobster tale as surf and turf for sharing (not on the menu in this constellation but explicitly agreed by our waiter to not be a problem). We received one plate with the complete steak and one plate with the lobster tale (and no separate plates for sharing). In the end, we just expected more in terms of quality of service from an iconic NY steak house. 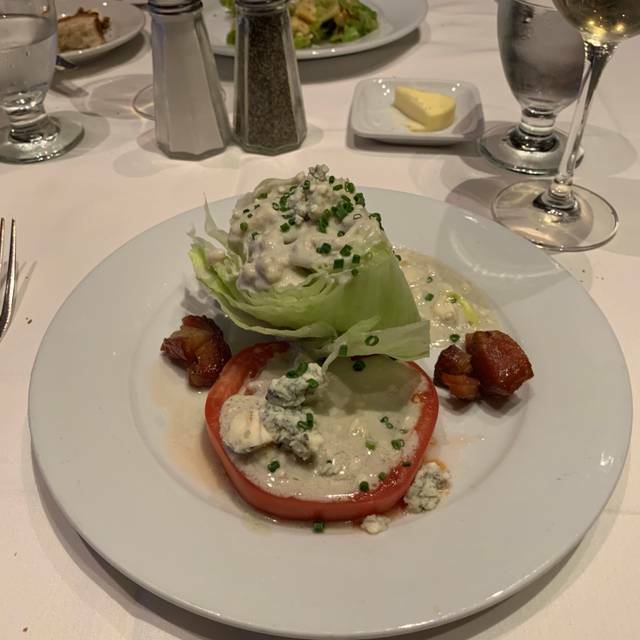 If you are not just looking for a good steak but also to have a great evening, you may want to consider alternatives to Gallaghers. The food quality was excellent. It was prepared exactly as requested. The service was prompt and considerate. It was a wedding anniversary event which was noted by the service staff with a song and a tiramisu with a candle! We highly recommend this restaurant, especially if a good steak and good service is desired! Anniversaire. Probablement les meilleurs steaks jamais mangés. Been to Keans before in NYC and this is just as good in my opinion and has a far better atmosphere / vibe. Not cheap with sides at around $15 per item on top of the steaks but I must say that the fillet mignon was one of the best I have ever tasted! And their home made steak sauce is truly sensational. Special mention to Carlos (a waiter) who struck up a friendship with our 14yr old son talking about the English Premier League....definitely recommend for a special occasion. We had not been to the restaurant in many years and we had a fabulous experience. Food, service and overall ambience was terrific. They gave us a wonderful table and it was totally enjoyable. It was not cheap but it was totally worth it. It was a terrific restaurant for a serious pre-theater dinner. My favorite steakhouse in the US!! !